Hello everybody! 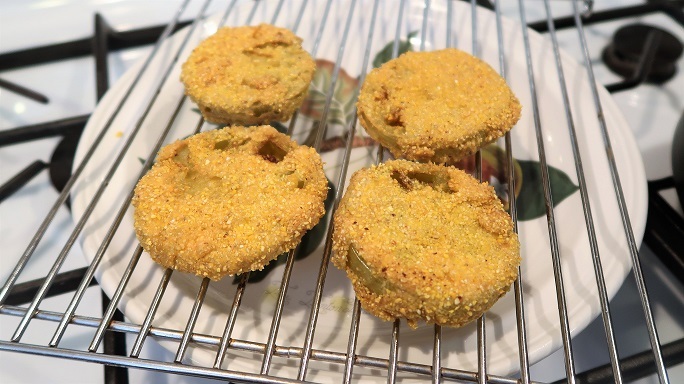 Today I am sharing with you how I make fried green tomatoes. I went into my garden to pick some fresh tomatoes for a salad, but found that most of them were still green. A few summers ago, one of my subscribers suggested I try fried green tomatoes. My wife took it upon herself to learn the recipe and we were hooked. It is now a must have in the summer for us. Watch the video below as I prepare the fried green tomatoes or continue reading for the written recipe. Start by pouring some cornmeal onto a dish, enough to cover each side of each slice of tomato. Pour the all purpose flour onto a separate dish, enough to cover both sides of each slice of tomato. To the all purpose flour, add a pinch of salt and black pepper and mix together. In a bowl, add the eggs and a pinch of salt and black pepper, to your preference, and scramble together. Fill a frying pan about half way or with enough olive oil to completely cover the tomato slices. Heat up on the stove while preparing your tomato slices and dip, as the oil must be really hot before you start frying the tomatoes. 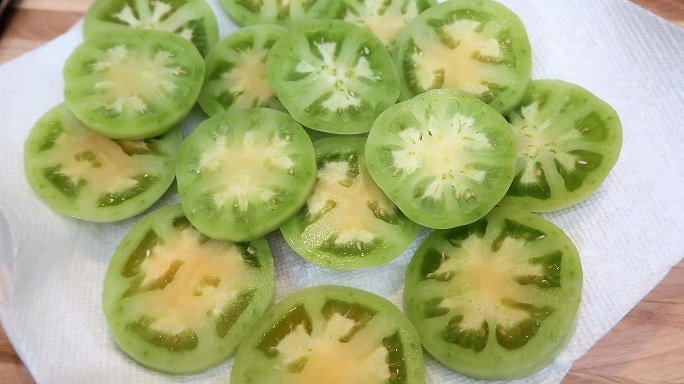 To prepare the tomatoes, cut off each end of the tomatoes and then slice them into 1/4 inch slices. I recommend placing the tomato slices on a dish lined with a paper towel to absorb any excess water. Once the olive oil is hot, take each tomato slice and pat each side into the flour, then dip into the eggs, and lastly pat each side with cornmeal. Place each tomato slice into the frying pan and fry each side for about 4 minutes. Remove the fried green tomatoes from the frying pan and place onto a rack over a dish to collect the excess oil or a dish lined with a paper towel to absorb the excess oil. For the dip; add the buttermilk, mayonnaise, pinch of salt, pinch of black pepper, and parsley into a bowl. Next, add about a teaspoon of lemon zest into the bowl. Cut the lemon in half and squeeze the juice of only one half of the lemon into the bowl. Mix all together. 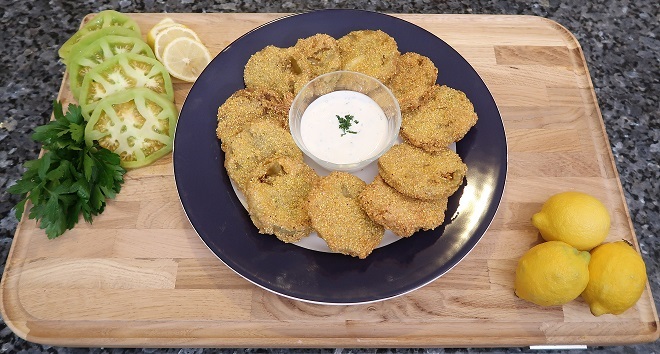 Serve the fried green tomatoes with a side of dip and enjoy! Cin cin!